Recognition and Appreciation For The Deserving Policeman Or EMT On Your List. Police Awards and plaques for police officers, EMS Awards, Policeman Gifts and EMS Gifts from FireAwards.com. 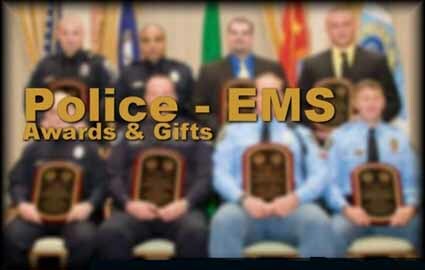 Browse through the FireAwards.com selection of Law Enforcement and Emergency Medical related awards, gifts, clocks, and more. Be sure to check our Tee Shirt and Family Badge sections for even more great gift ideas. There is no better way to show your appreciation and respect then presenting a beautifully engraved award from FireAwards.